Conveniently located in North Goa, Casa Britona is a great base from which to explore this vibrant city, with the airport 45 minutes away. Casa Britona is home to 8 bedrooms, all tastefully furnished to provide comforts such as air conditioning, free wireless internet access, a desk, ironing facilities, a mini bar, and complimentary bottled water. This hotel has a number of facilities available to all hotel guests including a restaurant, bar, room service, airport transfer, laundry service, safety deposit boxes, and tours. There is also a spa, with massages available, and an outdoor pool. The city's main attractions such as the Mondovi River, Panjim River Cruise Jetty, and the Chapel of Our Lady of the Mount are within close reach, so visitors will love the hotel's location. 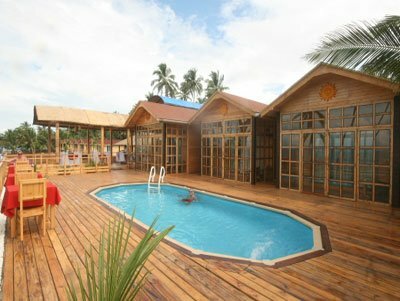 If what you're looking for is a conveniently located hotel in North Goa, look no further than Nordest Lemonmint Beach Resort. From here guests can easily access all that the city has to offer, and arrive and depart easily from the airport, just 30 minutes away. Step into one of 24 inviting rooms with a mixture of modern and rustic decor, and escape the stresses of the day with a wide range of amenities including a LCD/plasma TV, separate dining area, ironing facilities, mini bar, complimentary bottled water, and free wireless and LAN internet access. A haven of rest and relaxation, yet steps away from the city's numerous attractions including Calangute Beach, Candolim Beach, and Baga Beach. 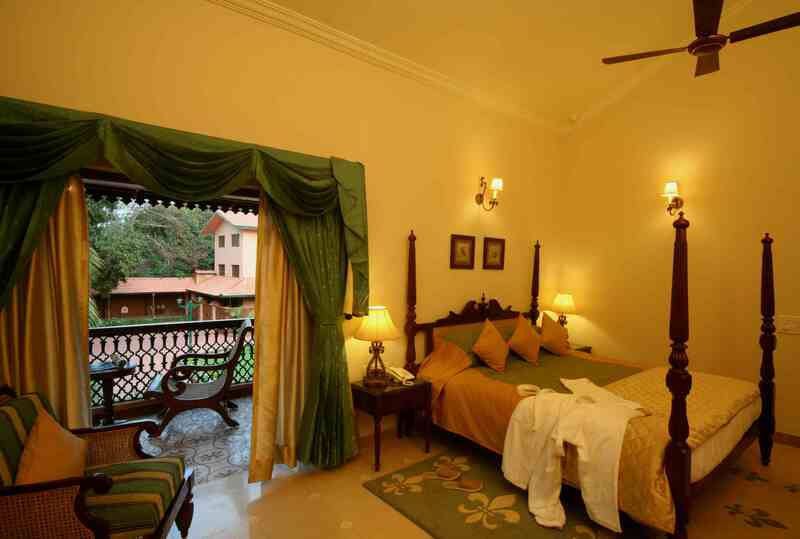 Nordest Lemonmint Beach Resort in Goa! Offering quality accommodations in an area that features an exciting nightlife, beautiful beaches, and mouth-watering restaurants, the Azzure By Spree Hotel is a popular selection for both leisure and business travelers, located 15 km from the city center, and 45 km from the airport. Guests can choose from 49 rooms, all of which exude an atmosphere of peace and harmony, the white and azure blue decor will sweep guests off their travel-weary feet. The recreational facilities are equally desireable with a fitness center, outdoor pool, kids' pool, and spa with massages. Top attractions in the hotel's nearby area include Calangute Beach, Candolim Beach, Tito's Pub, and Cafe Mambos. Azzure by Spree Hotel in Goa! Strategically located for both adventure and retreat, in Candolim, North Goa, Silver Sands Hideaway is a great base from which to explore this area 43 km from the city center and 70 minutes from the airport. Step into one of 23 inviting rooms and escape the stresses of the day with a wide range of amenities. This hotel features room service, airport transfer, restaurant, bar, smoking area, poolside bar, meeting facilities, safety deposit boxes, tours, wireless internet access in public areas, and laundry service as well as an outdoor pool and children's pool. Top attractions close to Silver Sands Hideaway include Candolim Beach, Calangute Beach, Fort Aguada Beach, and Tito's Pub. Silver Sands Hideaway Hotel in Goa! Well-positioned in Anjuna, the 4-star Hacienda de Goa Resort is strategically located for adventures during the day and a relaxing retreat at night, 15 km from the city center and 40 km from the airport, attractions and travel can be accessed easily by guests. Experience high quality room facilities in this resort's 22 rooms bright and spacious rooms, which includes a separate shower and bathtub, air conditioning, balcony/terrace, and microwave to help you recharge after a long day. The Hacienda de Goa Resort is located in close proximity to a number of local attractions including Anjuna Beach, Anjuna Flea Market, and Ozran Beach which gives this hotel special charm. Hacienda de Goa Resort in Goa! 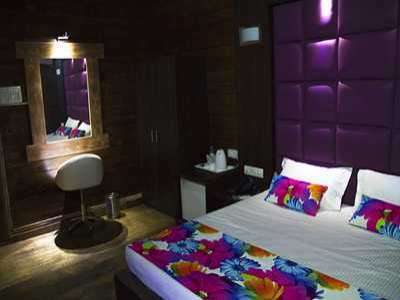 Located in North Goa, Aryans Hotel is a great base from which to explore this vibrant city but have a quiet place to return at night, 12 km from the city center and 55 km from the airport. The ambiance of Aryans Hotel is reflected in every one of the 7 guestrooms which each feature a balcony/terrace, air conditioning, shower, in-room safe, mini bar, and free wireless internet access. The Aryans Hotel provides a restaurant, coffee shop, bar, airport service, tours, valet parking, a car park, and room service as well as an outdoor pool to enhance guests' stay. 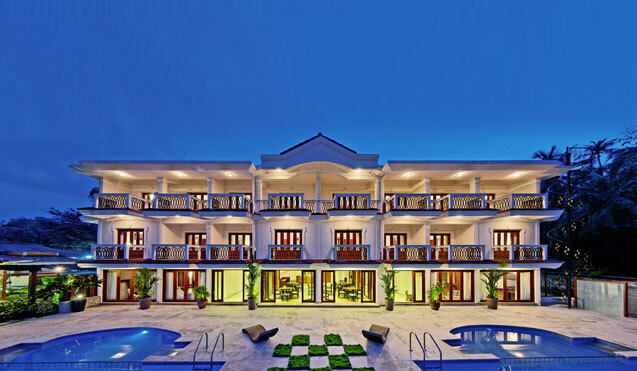 For sightseeing options and local attractions, one need not look far as the hotel enjoys close proximity to Ozran Beach, Vagator Beach and the Chapora Fort. Ideal for fun and relaxation, Casa Severina Hotel is located in the Calangute area of North Goa, 15 km from the city center and 45 km from the airport, where guests can easily access all that the lively city has to offer. 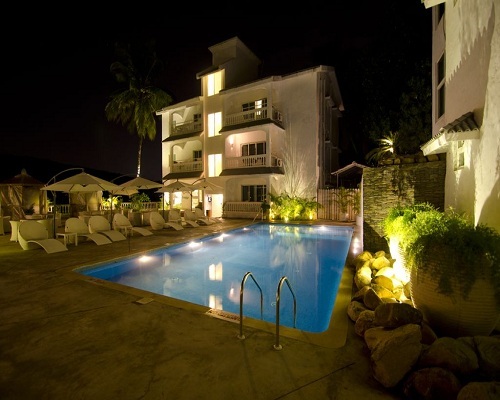 Casa Severina Hotel features 19 beautifully appointed guest rooms. The recreational facilities are also impressive with a fitness center, coutdoor pool, spa with massages, and a garden. A well-kept environment, and its proximity to the attractions including Calangute Beach, Candolim Beach, Tito's Pub, and Cafe Mambos, all give this hotel a special charm. 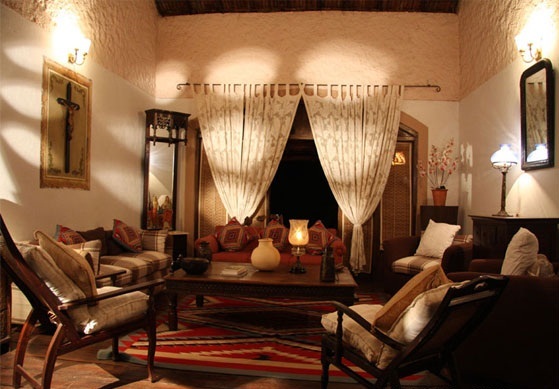 Casa Severina Hotel in Goa! 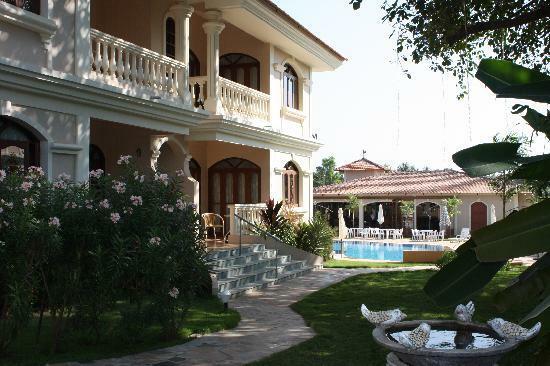 When visiting North Goa, you'll feel right at home at Casa Anjuna, which offers quality accommodation and great service, located 15 km from the city center and 40 km from the airport. All 19 guestrooms are decorated with traditional Indian colours, wooden furniture, and fabrics and feature air conditioning, complimentary bottled water, in-room safe, mini bar, and desk. The hotel also provides a spa, outdoor pool, and garden. Near the Anjuna Saturday Night Market, Britto's Bar and Restaurant, Anjuna Flea Market, and the Baga Beach, the Casa Anjuna is an ideal place for travelers seeking charm, comfort, and convenience in North Goa. Strategically located for adventure and retreat, the White Pearl Suites is located in the Baga area of North Goa, 18 km from the city center, and 48 km from the airport, with easy access to many local attractions. All 12 guestrooms feature a variety of comforts such as free wireless internet access, air conditioning, a seating area, coffee/tea maker, and ironing facilities. The recreational facilities include an outdoor pool, children's pool, spa with massages, and a peaceful garden. Nearby attractions include the Anjuna Saturday Night Market, Britto's Bar and Restaurant, Anjuna Flea Market, and the Baga Beach. 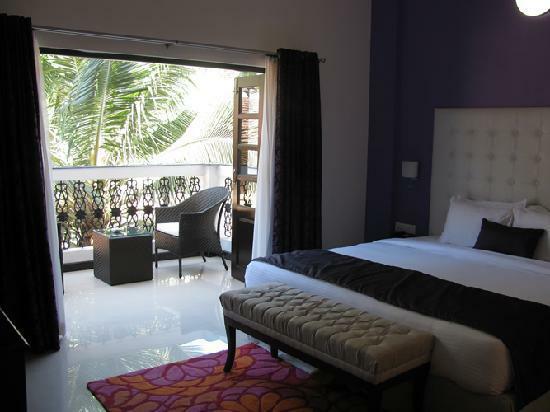 White Pearl Suites is a smart choice for travelers to North Goa, offering a relaxed and hassle-free stay every time. 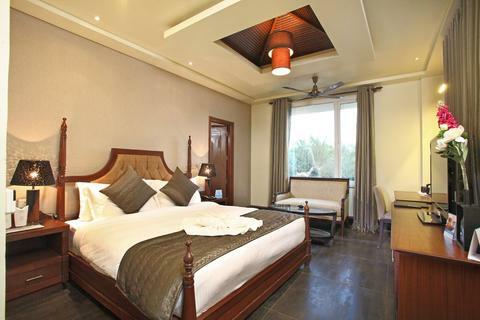 White Pearl Suites in Goa! Ideal for fun and relaxation, Godwin Hotel is located in the Candolim area of North Goa, 10 km from the city center, and 45 km from the airport. Hotel accommodations have been carefully appointed to the highest degree of comfort and convenience with 41 rooms featuring satellite/cable TV, complimentary bottled water, a desk, and free wireless internet access in some rooms. The recreational facilities include the outdoor pool, kids' pool, and garden. With proximity to Sinquerim Beach, Candolim Beach, and Fort Aguada Beach, and superior service give Godwin Hotel a special charm.